Haven’t made this salad in over 20 years! I used to make this salad with raw cauliflower but thought I would try using little florets and roasting them until tender and a little browned. Although it takes some time to cut the cauliflower into little florets, it is worth it. 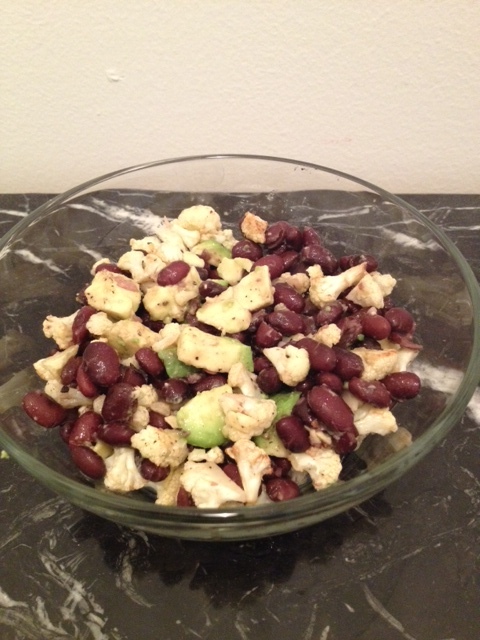 I made black beans from scratch (less sodium) and then mixed together cauliflower florets, black beans and chopped avocado. I spooned over the juice of half a lemon – didn’t need any oil as there was oil with the cauliflower. Super healthy and filling. Again, would go well in lunchbox. Toss florets in seasoned olive oil and roast in the oven for 20 minutes until tender and slightly brown. Let cool, then place in a mixing bowl. Add cooked black beans and avocado. Mix well together and pour over lemon juice.